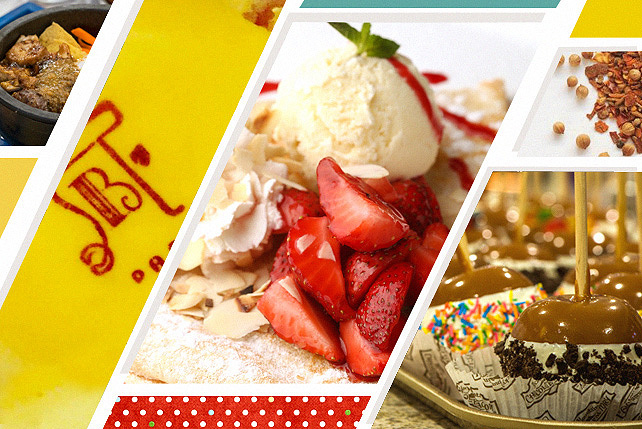 Name your crepe and they have it in spades. (SPOT.ph) The newly opened Bizu in Eastwood bears the same well-known white script on a pink background. Its glass displays are filled with the same rows of macarons and cakes. Its shelves carry the same exquisite takeaway packages. But this Bizu is special. 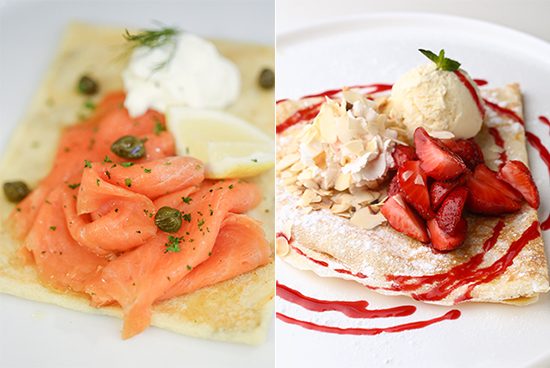 It’s called Creperie—the first of its kind—and it touts an amazing line-up of their new signature offering. Don’t worry. 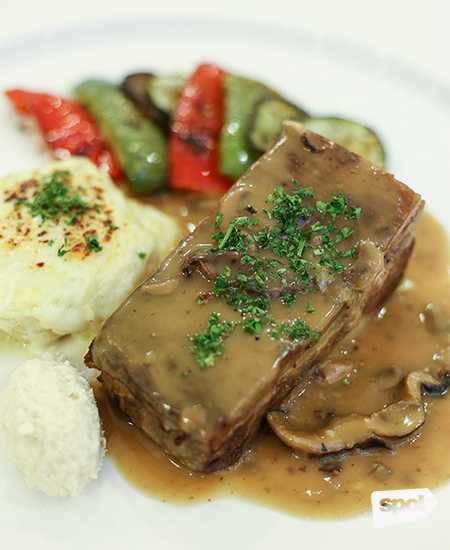 The 10-Hour Angus Roast Beef (P655), a bestseller across all Bizu’s brands, is available (we checked). 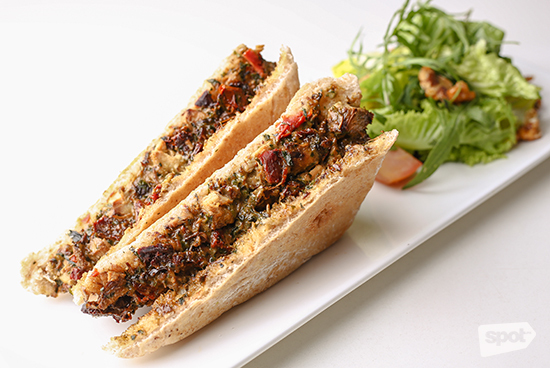 The small kiosk-slash-cafe on the third floor of Eastwood Mall allows Bizu little elbow room to whip up more sophisticated cookery, but they’ve made space for crowd-pleasers like the Mixed Ravioli (P325), French Onion Soup (P195), and Herb Chicken Sandwich (P285). But it’s the crepes—sweet, savory, thin pancakes fortified with beloved flavor combinations—that have us taking second glances at this Bizu. Bizu chef Xander Tanco cooks this tricky dish with the ease of someone pouring sugar in coffee and his crepes come out beautifully thin and crisp every time. “The base is the same for every one, but the flavors all come out different,” he tells us. There are about 19 on the menu, nine savory and 10 sweet. At a time when dishes and desserts are going for heart-racing toppings and "shock," Bizu’s crepes are elegantly minimalist. The flavors are distinct but delicate, exactly how a crepe should be. Chef Xander has no problems with basics done right. Basics, after all, never go out of style. 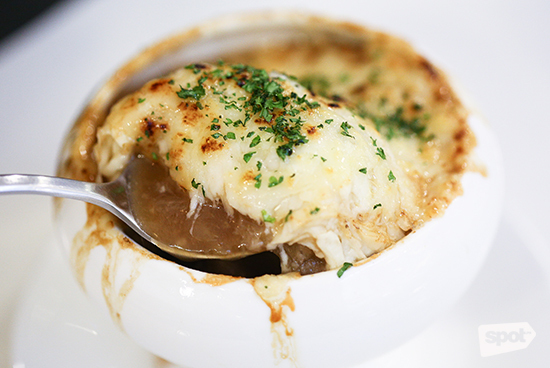 The most basic option is the Beurre Sucre (P185), which has us instantly captivated. 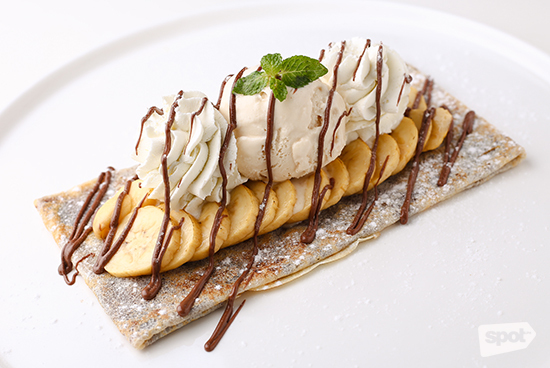 The crispness of the ultra-thin crepe is enhanced by bruléed sugar. The sweetness is mellow but pronounced; the salted caramel ice cream is the little touch that gives refinement to the flavor. 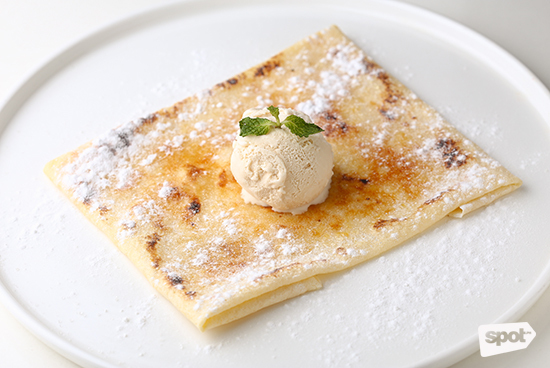 The chef tells us that their portions are for sharing, but this crepe would test anyone’s generosity. Chef Xander goes for that nuanced approach. 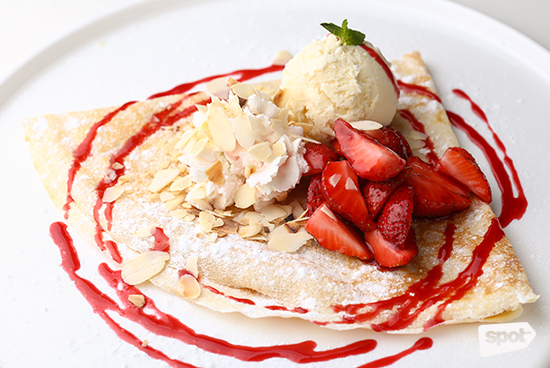 When he serves a crepe with strawberries and cream, he gives you all the elements of strawberries and cream—sweet, tart, light, but rich. Bizu's Strawberry Rose (P335) is a light-as-air revelation of rose chantilly cream, roasted almonds, vanilla ice cream, and fresh strawberries. When you take a bite of the picture-perfect Grand Chocolat (P315), you can tell right away that they use only premium stuff. The 70% dark chocolate couverture is deep and bittersweet, subtle but bold—qualities only good dark chocolate can have. 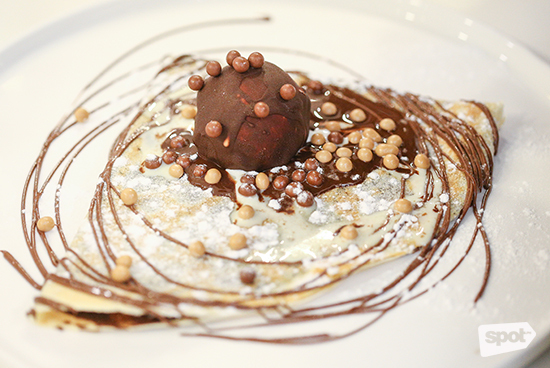 The crepe is smeared with a wonderful chocolate cream that amplifies the intensity, and some extra crunch comes from the Valrhona caramel pearls. A classic combination is the Banana Nutella (P295), which is heavier in texture compared to the others, but still amazingly light. It doesn’t take an expert to know that this will be—if it isn't yet—a runaway hit. But Bizu, an institution in the food industry which could probably retire with their army of French cookies, still manages to throw a few curveballs. Chef Xander pulls out the White Coconut (P195), his personal favorite, which he described to us the same way an artist would his muse. Our expectations are raised, we tell him. "They should be!" he replies. The menu says that it's a "simple combination of dried white coconut, Belgian white chocolate, lemon juice, vanilla ice cream, and royaltine flakes." It sounds delicious, though we can perfectly understand why it could be overlooked next to chocolate and Nutella. 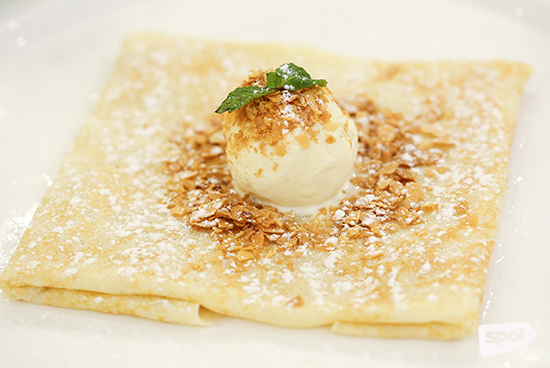 The crepe is filled with desiccated coconut and topped with crushed toasted crepe for texture. “Royaltin flakes are from ruined crepes that are toasted and used to decorate cakes,” the chef informs us. “It’s like barquillos.” Lemon bolsters that tropical flavor and the effect is akin to the taste of pineapple! It's not too tangy, not too coconut-y, not too sweet. This crepe is pure precision. We’re getting carried away with the sweet stuff, but the savory options definitely pull their weight. 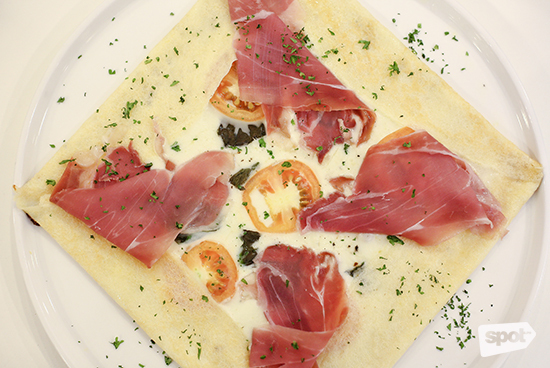 The Marguerite (P385), with its medley of cheese, tomatoes, basil, and prosciutto, is so comforting. The combination is more associated with a certain pizza, but Bizu’s crepes give it a run for its money. The briny ham is a great push in flavor. The Crêpe Complète (P295) feels a little bit like breakfast. 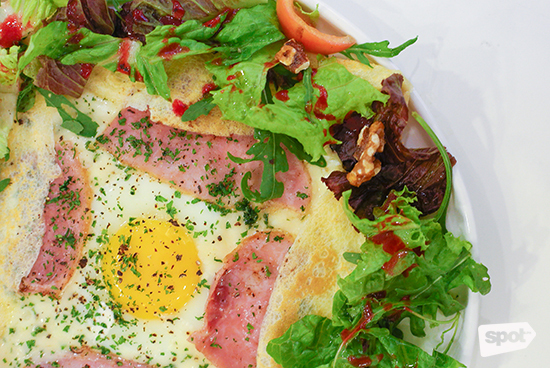 The crisp galette is topped with a winning trio of smoked ham, Emmental cheese, and a gooey egg. Get it with a side salad (P80). The greens, arugula especially, plus the raspberry vinaigrette and candied walnuts really develop a more diverse interplay of flavors in the dish. The Smoked Salmon (P375) is a fail-safe option. A generous heap of pink fish is gracefully laid over a crisp, flat cake, and fashioned with sour cream, white cheese, capers (obviously), and a lemon wedge—the last one only for the most discerning of diners, because the flavors come through just right. 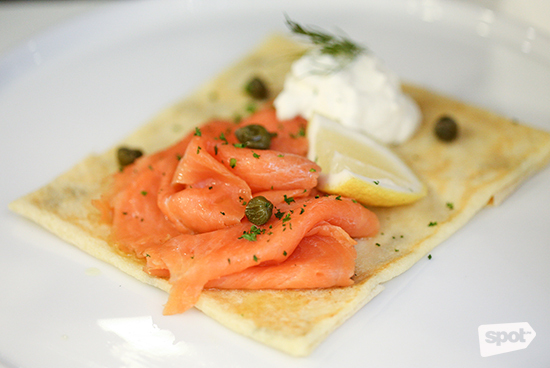 This dish makes us wish that Bizu Creperie would open for breakfast, not that it's less enjoyable any other time. 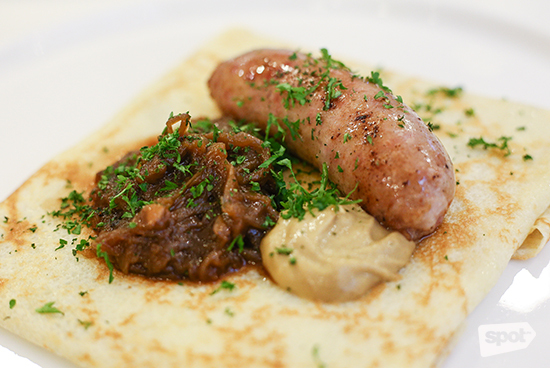 Chef Xander designed a heftier crepe dish in the Sausage Crepe (P395). A homemade Toulouse sausage, caramelized onions, mustard, and cheese are as burly as delicate French pancakes could be. 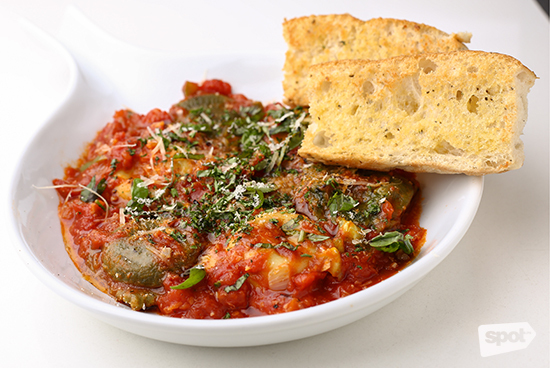 The sausage is slightly loose, slightly fatty, but immensely juicy and flavorful. The mustard, which might seem a little too piquant for crepes (in this case it's not), is a great brush of balance that ties everything together. 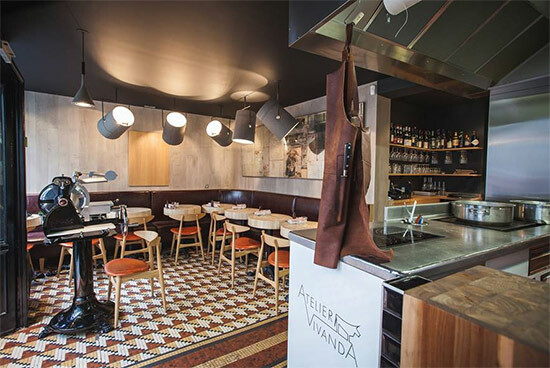 Bizu Creperie opts for a general appeal, and while not all flavors may be found in the sidewalk cafes of Paris, the techniques are definitely traditional. Chef Xander can't wait for what's next. His crepes right now look like elegant, photogenic works of art that Filipinos would appreciate, but he tells us of French crepes, which are frayed at the edges and beautiful in its rusticity. He's getting buckwheat flour this year—a step closer to authentic French style—which will definitely embellish more flavor in the dishes. We, on the other hand, are excited for his crepe cakes.